The key is not to prioritise what’s on your schedule but to schedule your priorities. As we come to the middle of the year it’s time to stop, reflect and reset. I did this over the weekend with a group of dedicated entrepreneurs. It was so energising, motivating and … hugely beneficial. We commence the year, focussed, energised by our goals and then after about 90 days, life catches up with us and we tend to relax back into our comfort zone. Life throws us curve balls too and we either end up on a ‘roller coaster ride’ or get caught on the ‘merry-go-round’. I’m reminded of the story about priorities by Stephen Covey in First Things First, to ‘get back on-purpose’. Jim Collins in his book Good to Great revisits this story also. One day, a time management expert was speaking to a group of business students and, to drive home a point, used an illustration those students would never forget. 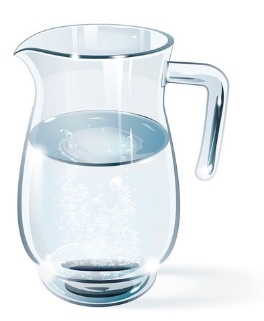 As this man stood in front of the group of high-powered overachievers, he said, “Okay, time for a quiz.” Then, he pulled out a one-gallon, wide-mouthed Mason jar and set it on a table in front of him. Then he produced about a number of fist-sized rocks and carefully placed them, one at a time, into the jar. Then he said, “Really?” He reached under the table and pulled out a bucket of gravel. Then he dumped some gravel in and shook the jar, causing pieces of gravel to work themselves down into the spaces between the big rocks. Then, he asked the group once more, “Is the jar full?” By this time, the class was onto him. “Probably not,” one of them answered. What are the ‘big rocks’ in your life? A project that YOU want to accomplish? Time with your loved ones? Your faith, your education, your finances? A cause? Teaching or mentoring others? Remember to put the BIG ROCKS in first or you’ll never get them in at all. What are the ‘big rocks’ in my life or business? So, tonight, or in the morning, when you are reflecting on this short story, ask yourself this question: What are the ‘big rocks’ in my life or business? Then put those in your jar first. 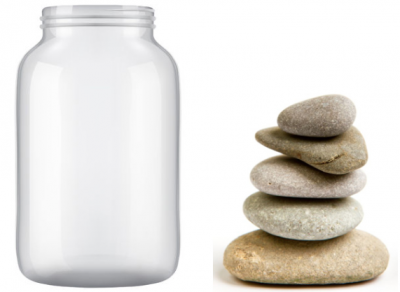 Many of us have a daily practice of filling the jar with pebbles and sand … and we are ‘busy’ doing just that. How often do you greet people and ask them how they are and get the answer, “I’m really busy”! But busy doing what? The ‘sand’ in our working lives is all the low priority tasks that constantly demand our attention such as emails, social media, phone calls. Many people I know commence the day by opening their inbox. 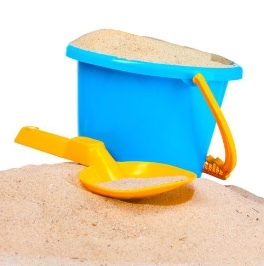 So often we want the quick wins to tick off our ‘to-do-list’ that we keep focussing on the sand and pebbles. Before you know it, its mid-afternoon, mid-week or mid-month and the big rocks are still out of the picture. The ‘pebbles’ represent the higher value tasks that are not critical strategic drivers of your business or career (meetings, reports, quotes, social interaction and so on). Focussing on the ‘big rocks’ accelerates your progress towards your long-term goals and vision. (This whole story assumes that you have a clear vision or a BHAG (Big Hairy Audacious Goal) as Jim Collins puts it. Thanks to taking time out to review, refocus, readjust and reset my goals, it became clear that one of my ‘big rocks’ had disappeared. While I still had focus on the other important strategic drivers, I experienced a nagging and sometime depressing frustration that one of my big, meaningful and important goals had been ignored. I wonder if you ever feel like that too? On reflection, I think there were several reasons for this. Firstly, I believe my vision was unbelievable. 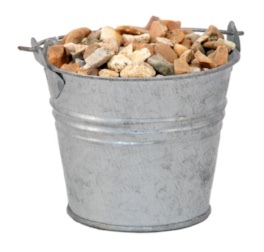 Secondly, my daily/weekly jar was full of pebbles and sand; Thirdly, I had taken my eye off the big rocks; and fourthly, I am guilty of the ‘bright shiny syndrome’. Often my fascination is with new projects and the temptation to chase the next bright shiny thing means my energy will always go towards the newest and exciting project, and consequently, away from my key goals and projects. Finally, I did not review my top priorities or ‘big rocks’ frequently or consistently. I strongly encourage you to take time this week or over the weekend to plan for the rest of the year – or at least the next 90 days. Ask and answer these questions. Is my vision relevant, believable and inspirational? Where am I now in relation to the goals I set at the beginning of the year? Are my goals in alignment with my vision and/or my BHAG? Do I need to adjust these? What 3 ‘big rocks’ will I focus on in the next 90–180 days? Who needs to be involved to help prioritise these? Are they tangible, achievable, measurable, meaningful and inspirational? Where will these show up in my weekly calendar? What are the milestones that will keep me/us focussed and on-track? 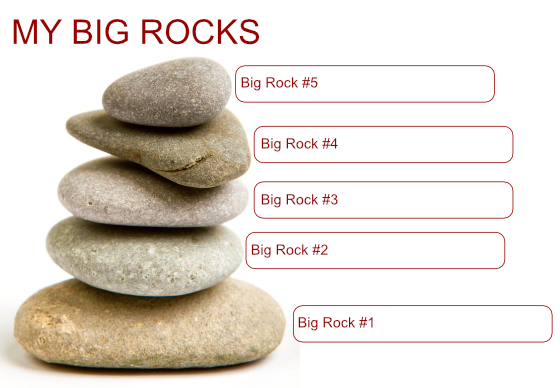 If you have a team, meet with them to determine the three ‘big rocks’ for the quarter and ensure that all members of the leadership team have their own three ‘big rocks’ with due dates. Having weekly, monthly and quarterly review meetings will be essential. We cannot focus on everything at once. As the saying goes, when everything is important, nothing is important. By laser focussing on our 3-5 most impactful strategies, we declutter our mind (and to-do list) and progress improves exponentially. As William James so wisely stated – ‘That which holds the attention, determines the action’. Take the first steps now. What are your 3-5 Big Rocks for the next 3-6 months? Please let me know if I can assist you in prioritising and implementing your ‘big rocks’ over the next 6 months so that you experience the deep satisfaction and fulfilment of truly being on-purpose! 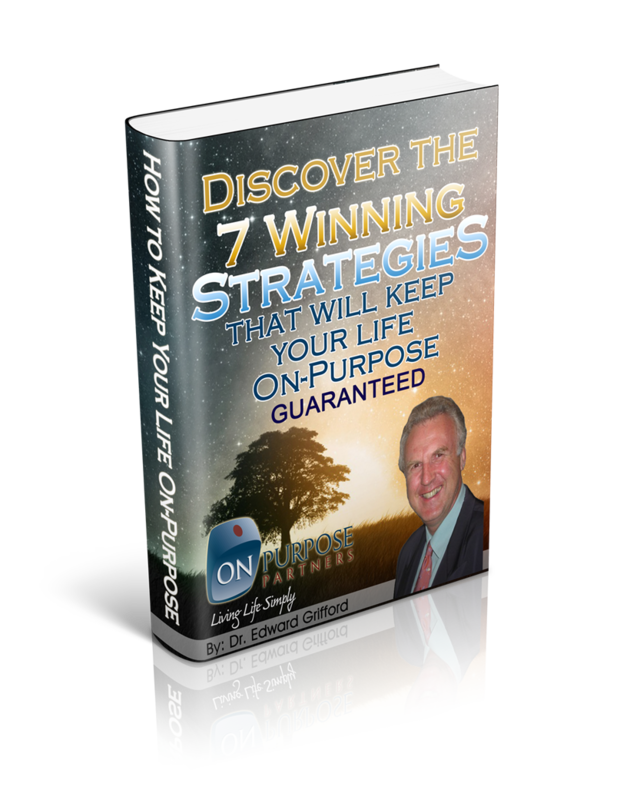 Please accept my free gift to you, my latest eBook that helps you get on track with purpose! Are You Caught in the Work Trap? Being a TOP Performer Part 1 – Me Inc! or Me Stink!